Maximum size: about 150 mm (most much smaller). Identification: This sea hare is light olive to brown with darker brown blotches on the sides of the parapodia. Younger animals are usually lighter in color with larger brown blotches. However, some may lack spots completely. The posterior portion of the foot forms a distinctive sucker. Natural history: Aplysia juliana is a moderately common species that is largely restricted to rocky habitats where there is an extensive growth of the green alga Ulva on which it feeds. It occurs at depths of < 1 to 2 m (< 3 to 6 ft) at protected to moderately exposed locations, usually where there is some fresh water and nutrient seepage. It's nocturnal, concealing itself under rocks during the day. 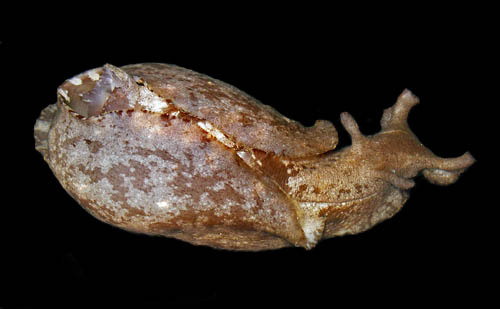 The posterior sucker on the foot allows it to cling to algae and rocks, crawling "inch-worm fashion." It ejects a milky white fluid when disturbed and lays a tangled, yellowish-brown egg mass that is usually attached to the underside of a rock. Distribution: Maui and Oahu: circumtropical. Taxonomic notes: Aplysia sandvicensis Sowerby, 1869 is a synonym (Kay, 1979). It's referred to as "Juliana's sea hare" in Hoover, 1998 & 2006. It was first reported from Hawaii in Pease, 1860 (as Syphonota bipes) and is listed as Tethys bipes in Edmondson, 1946 and Ostegaard, 1950. Photo: CP: 100 mm: found by PF; on beach fronting Halama St., Kihei, Maui; March 12, 2011.